Could the last doctor leaving rural SA close the door? Interesting week in Adelaide – the new ‘South Australia State logo’ was unveiled at the Festival Centre. I managed to get along and, along with many others, was significantly underwhelmed. Criticisms are that SA looks like the largest open cut mine, visible frm space…or a series of doors….or a Pope’s hat. Regardless, it has got people talking. Meanwh the KI Doctors are trying to get media attention for their plight with the SA Health Department. We simply cannot get any sense out of the CHSA Health Bureaucrats and are trying to get the Health Minister Jack Snelling to take action. 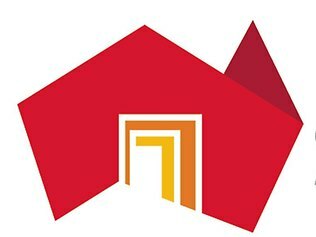 Latest media release plays upon the ‘doors’ theme of the SA logo. My fear is the door is closing to get a resolution on this issue. Media interest this week in the profound wait (up to six weeks) to see a doctor in rural SA. Currently KI Docs have a mix of pre-bookable and ‘book-on-the-day’ appointments, meaning we can meet most demand on the day, and patients can see ‘their’ doctor within a few days for non-urgent consults. All this will change if CHSA do not resolve the crisis. Read the Media Release here …. and make your own comments known by either hitting the airwaves (891 Adelaide, fiveAA), writing to the media (The Islander, The Advertiser), or telling the State Health Minister what you think. I am up in Adelaide this week, doing some anaesthetic upskilling, catching up with friends & family at WOMAdelaide, then jetting off to Sydney to present a short piece at #SMACC2013. Bit daunting being in the company of gurus like Mike Cadogan, Scott Weingart, Cliff Reid, Casey Parker and Minh le Cong etc. You can read more about the dispute here, here and here. At the heart of the dispute is almost a philosophical question – whose responsibility is it to staff the roster for the State-owned public hospital? Whilst rural doctors have always fulfilled that role, the insistence that they are responsible for the entire roster even to the point of paying a locum to do the job does stick in the craw – on KI we have enough doctors to run our Clinic…but not enough to cover three rosters for each of A&E, Obs and Anaes…unless we work ourselves into the usual outcome of days gone past – early death, alcoholism, relationship breakdown, major depression and medical error. So, here is a round up of media reports (to date) on the KI crisis – CLICK on the links to read associated news articles or media releases. See also the comments section – mostly supportive, although one Islander did wonder why the six local doctors could not work as hard as the 3 doctors 20 years or so ago. Fair comment and I would encourage such questions. 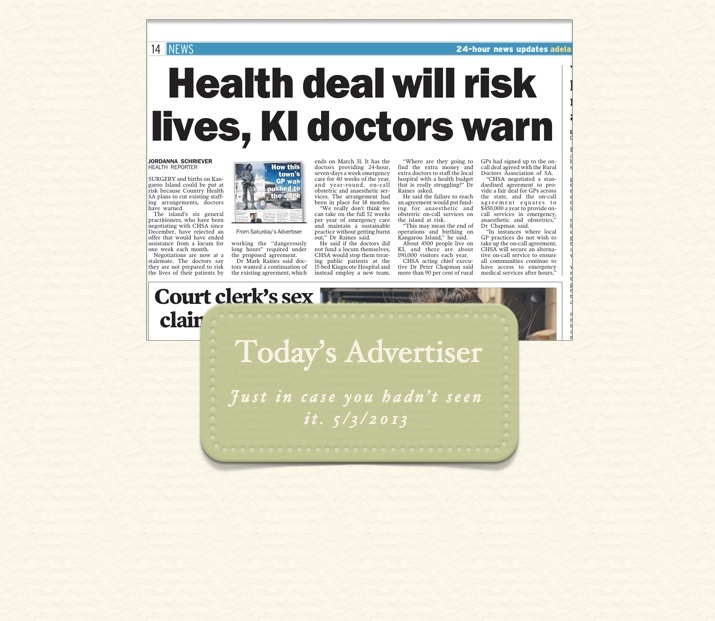 Suffice it to say that the three doctors are no longer working on KI – one has left rural medicine entirely. When we talk to them, they cite the unbearable workload and not one wishes he had worked as hard. New doctors want to spend time with family, to relax…they still work a 40 hour week in the Clinic plus are on-call another 30-90 hours per week depending on the roster. Leading with a photo from the dispute some years ago, The Islander will no doubt invite comments (both positive & negative) from readers. Regardless of what you think of the Doctors, it is important to realise that this is happening and will affect delivery of services. The docs simply cannot work more than they are currently. Sadly no ‘comments’ section, but hopefully local ABC will continue to repo this both on line and on radio. “Doctors on Kangaroo Island say that the State Government wants them to work dangerously long hours because it won’t cover the cost of a locum. The island’s six GPs work normal hours in a clinic and then provide around the clock services to the Emergency Department at the Kangaroo Island Hospital for 40 weeks a year. Country Health SA employs a locum to staff the Emergency Department for one week a month to provide respite for the doctors, but that will stop at the end of this month. Negotiations over a new arrangement for the island’s doctors have failed. The doctors are hoping the Government will reverse its decision. Country Health SA has disputed claims by GPs on Kangaroo Island that a new workplace agreement will result in them working dangerously long hours. From next month Country Health SA won’t be funding a part-time locum to staff the Emergency Department at Kangaroo Island’s hospital. It means that the island’s six GPs, who already provide on-call Emergency Services most of the year, will have to pick up the locum’s workload. Local MP Michael Pengilly has been working in the corridors of Parliament to raise the issue and issued a media release and was interviewed on 5AA with Leon Byner, transcript below. That is all for now. More updates as and when they occur.